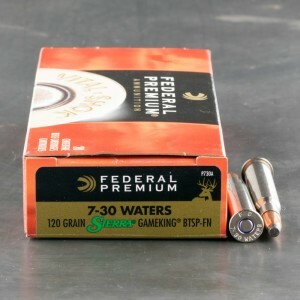 7x30 Waters ammunition was a wildcat load developed by Ken Waters in 1976 to be an improvement over the .30-30 Winchester but keeping it in a lever-action gun. He necked down the .30-30 case to accept .284 inch (7mm) bullets. The .284 or 7mm line of bullets is well-known for its inherently high ballistic coefficients and great sectional densities. The .30-30 usually sports 170 grain bullets while the 7x30 something less but with higher velocities than the .30-30. Together, Waters intended to put a superior bullet downrange faster and flatter. He succeeded. But, was the performance enough to impress the gun manufacturers to chamber for it? Well, Winchester did build lever guns for the round for a time. Now, new guns sporting this chambering are made primarily by Thompson Center for its Contender gun. Since the round was initially offered in tube-fed guns, that configuration necessitated the use of round-nosed bullets unless guns were used as single shots or only held two rounds. Hornady's introduction of it LEVERevolution ammunition enabled shooters to squeeze a bit more performance out of their lever guns without using them as single shots.